Today is Day 5~ Waistband and Finishing Touches! Because I use the cutting mat to measure, I just measure one side and double it. The method for measuring is up to you. Just be sure you get the entire measurement around. Once you have your measurement, cut a rectangle piece of fabric that length plus seam allowance (1/s inch). For example, my measurement was 39 inches around. I was able to get one piece of fabric that length. So I cut it 39.50 inches so that when I sewed the seam for the waistband it would still be long enough to sew onto the skirt. If you need two pieces of fabric to make your waistband, be sure you add seam allowance to each piece! Here is my piece. 39.50 inches long. Take your piece and put right-sides together. Stitch the open ends together on your machine or serger. Finished piece should measure the same amount as the top of your skirt. In my case, this piece measures 39 inches around. Leave your rectangle piece inside-out. Be sure your skirt is right-side out. 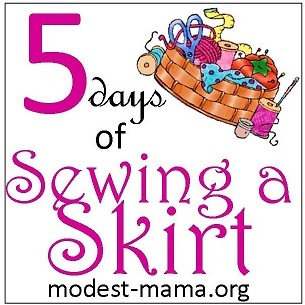 Pull the waistband piece over the top of your skirt, keeping right sides together. Line up the top of the waistband with the top of your skirt. Pin the pieces near the top. Sew the waistband to the skirt near the edge. Fold your waistband up and either finish the top edge with your serger or with a zig-zag stitch. Just go around the very top, sewing the stitch and no additional layers. This will help with fraying in the waistband. Now it is time to add the elastic. Head back over to the iron and press the very top of the skirt down 3/4 of an inch. Use pins as needed to keep the 3/4 inch laying nice and flat. This is called making a casing. Since we are using 1/2 inch wide elastic, this 3/4 inch casing will provide plenty of room for our elastic to live in. Use your machine to stitch the casing closed except for an opening about 1 to 1.5 inches. Try to stitch on the serged or zig-zagged part of the fabric. Once your casing is closed except for the hole, it is time to measure your elastic. You can follow the directions on the package for measuring, but I like a more snug fit with elastic. I measure the elastic around where I like the skirt to hang, and then I shorten it by about an inch and cut the piece. Place a safety pin on the end of the elastic and thread it through your casing. Be sure to hold on to the other end so you don't pull it into the casing. After the elastic is through the casing, you must sew the ends together. Overlap the ends without twisting them and sew a couple stitches back and forth across the overlap. Turn the skirt over and stitch the casing closed from the right side of the skirt. This way you can easily connect the ends to the casing stitch. Be sure not to accidentally stitch though the elastic. Elastic doesn't work as well once it's been stitched. Trim off loose threads and you have completed your skirt! This particular style skirt is so great because minor adjustments can make dramatic differences in the way it looks. Try changing little things and see what you can create! Can you believe all the diverse and interesting topics other moms are blogging about? Catch up with their final days of 5-Day blogging over here!